Fall weather and a steaming bowl of soup seamlessly slip in to one another every year. Once the weather turns from the sultry summer sun to that burnished hazy look of Fall, where the leaves outside burn crimson against the blue sky and the air chills down the moment the sun slips to the tree line, a steaming bowl of soup seems as natural as taking a breath. I used to be afraid of soups, in a life so far past that I can’t recall even the precise reason why. I think I didn’t understand how to properly build the flavor of soups, from the slow caramelization of the vegetables, to the added broth and simmer, the final seasoning; a pot of soup intimidated me, and I would marvel over those consumed at cozy cafe lunches, wondering what I could do to achieve such a grand blend of flavor and texture. The truth, once discovered, astounded me in it’s simplicity: a good pot of soup is built like a good house is built, from the ground up. Once this simple procedure is set, the possibilities are endless. The Soup and Stew category in my Recipe Index is loaded with content. No truer testimony to that perfect soup achievement can be found anywhere else; we’ve enjoyed some amazing, delicious and hearty soups over the years. I may not be the best at photographing them, but I certainly can make them now. I’m so glad too. There is so much love in a pot of soup, simmering on the stove, chasing the wild winds of Fall or Winter away, while keeping time with the hum of the furnace. They fill the house with warmth, with scent and with promise. And the versatility of soup, at least in my head, makes it a perfect meal to eat most every night, no special occasion, or long stretch of time needed. And then there is the health aspect of it, because you know I need to mention how perfect a bowl of thick vegetable soup can be, once you ignore the call of butter and cream. Some of my most perfect bowls of soup have been made from a handful of sadly forgotten vegetables from the refrigerator, past their prime for anything but to be chopped, sauteed and simmered to a delightful, steaming finish. And bread. Let’s not forget the perfect match to a perfect meal. A loaf of good sturdy bread. Soup and bread, like Fall and sweaters, just fits; it rolls of the tongue seamlessly, and makes perfect sense. A spoon in one hand, chunk of bread in the other, eagerly soaking up the broth and bits of herbs still clinging to the bowl. In my previous life working in an artisan bakery, a loaf of bread and a bowl of soup from the lunch counter was a regular meal, something I craved daily. And I still do. I can dip a saltine cracker in my soup, or nibble on corn muffins too, but nothing tastes better with soup than bread. 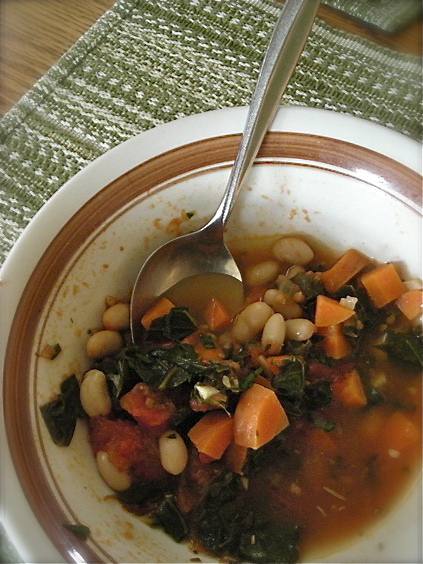 These days, without meat to bulk up my soups, I’m consuming them simply loaded with vegetables, and often, legumes. Thick bunches of chard, or spinach or kale make for stellar soups, along with sharply flavored carrots and a host of other possibilities. I’ve made several pots of green soup, throwing in baby bok choy along with the other hearty leafy greens, then pureeing it smooth, sipping it from a mug, feeling the bright green goodness flowing through me. 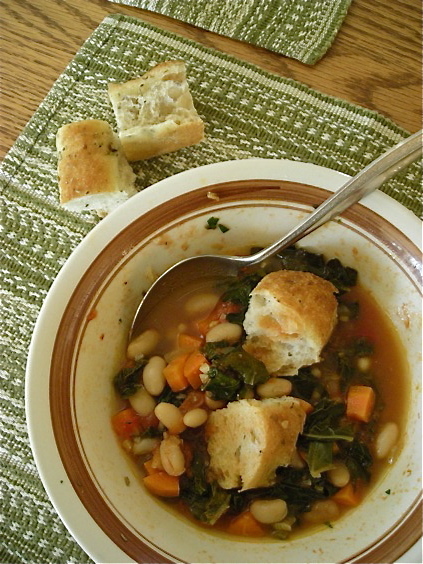 This hearty bowl of Ribollita, or Tuscan Bread and Tomato Soup, used up the very last tomatoes from the garden at the lake. Mike came home from a few days there with a sack of sadly misshapen and bruised fruit, the last of a summer bounty and I quartered them and roasted a large pan worth, reserving the tomato liquid and oil to help flavor this pot of soup. The tomato flavor was out of this world; sweet, deep and lush, and a large bag of chopped dinosaur kale added green goodness. This isn’t a brothy soup, and you don’t need to roast your own tomatoes to achieve it, given the availability of excellent canned products. Place the pot on your stove on a gray afternoon, and simmer it slowly. 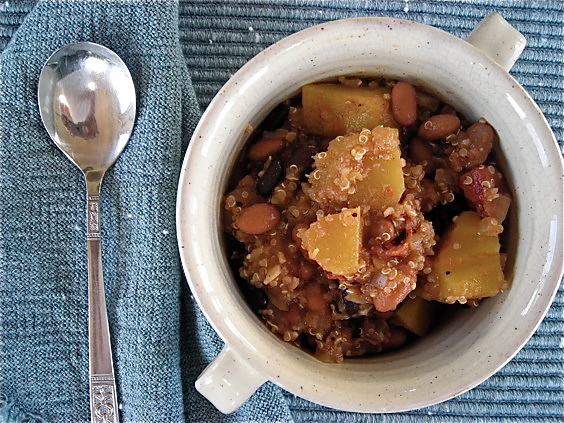 This one doesn’t take much time at all, but the flavor will fool anyone in to thinking it simmered forever. What is YOUR favorite soup? Do you like to make it at home? Heat a heavy-bottomed pot over medium-high heat. Add oil. When the oil is hot, add the garlic, onion, carrots, celery, and bay leaf and season with salt and pepper. Sauté until softened, 5 to 7 minutes. Add the frozen spinach and sauté for a moment to break up any large clumps. Add beans, stock, and tomato pureé. Bring soup to a boil. Stir in bread and reduce heat to a simmer. Cook until soup thickens slightly. Remove from heat and stir in chopped basil. Remove bay leaf and serve topped with grated Parmesan. 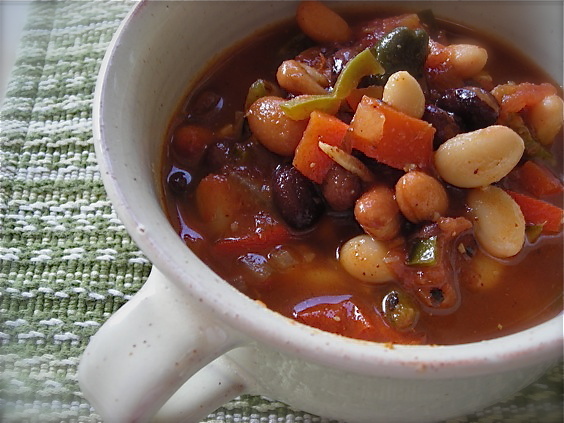 Hearty Minestrone – Forgive the horrid winter photo and just make that soup. Wow. 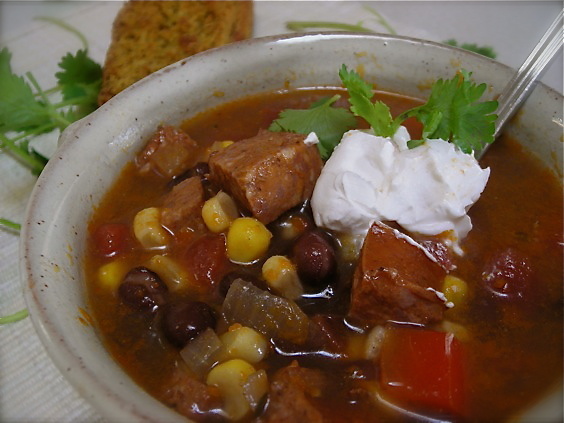 Chili Blanco – from 2007, so far back in the archives, and an amazing recipe. Amy gives you an amazing array of Fall soup options. Laurie shares an African Peanut Soup that I can’t wait to make.